Does Eating Chocolate Reduce Your Risk of Stroke? 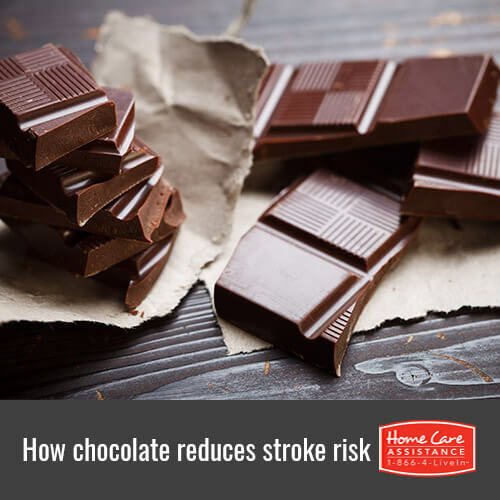 Seniors and post-stroke caregivers in Rhode Island can agree that chocolate is certainly a delicious treat, but it normally isn’t associated with health foods. Thanks to a recent study, that’s all about to change. Though an entire tub of chocolate ice cream may not be good for you, a 2014 study by Dr. Chun Shing Kwok from the University of Aberdeen found that eating two bars (or 100 grams) of Hershey’s chocolate each day could greatly reduce the risk of developing both cardiovascular disease and stroke. What Does Research Say About Chocolate, Strokes, and Heart Disease? The study consisted of reviewing data from almost 21,000 people in England who were regularly monitored over a period of 12 years. During this time, 14 percent of the people in the study had experienced a non-fatal heart attack or stroke. When researchers asked subjects about their chocolate consumption, they found that subjects who regularly ate chocolate were 11 percent less likely to experience cardiovascular disease or strokes and they were 25 percent less likely to die from a stroke or heart attack when compared to those who did not eat chocolate. These findings remained consistent regardless of whether people ate dark or milk chocolate. Additionally, most people who did not have heart disease or a stroke ate an average of seven grams of chocolate per day. How Can Chocolate Prevent Heart Disease and Stroke? Though the researchers are not certain why eating chocolate is consistent with reduced cardiovascular disease and stroke risk, there are a few theories about why it might be beneficial. It is possible that eating chocolate is not actually preventing these conditions because researchers noted that participants who ate more chocolate were younger and exercised more. However, the flavonoids and other antioxidants found in chocolate might be preventing heart disease and stroke by reducing inflammation and oxidative stress that lead to damaged blood vessels. The cocoa butter used to create chocolate is also an excellent source of heart-healthy fatty acids, which might explain these beneficial effects of chocolate. Although this study shows that chocolate may help prevent stroke and heart disease, diet isn’t the only way to monitor these conditions. Turn to a reliable provider of elder care in Rhode Island like Home Care Assistance to help your loved one reduce the risk of these and other diseases. We offer custom care plan designed to address your loved one’s unique needs in the comfort of home using the latest home care techniques. Our highly trained caregivers help with everything from prescription pick-ups and medication reminders to meal preparation and exercise. Contact a friendly Care Manager at (401) 284-0979 today to learn more about Home Care Assistance of Rhode Island and schedule a free in-home consultation.